Yep, this time Oswald was pretty unlucky, folks. Back in the Thirties (from the style of Oswald, that reminds me of his look in such shorts as "Happy Scouts", I guess we are around 1938) Walter Lantz tried to sell an Oswald daily strip series to syndicates, with no success. It looks as one week (6 strips) was actually made but remained unpublished. Someone tried even to sell those dailies on Ebay (as now, one strip is still auctioned at a "reasonable price" and I don't know if the other ones were sold or not). David Gerstein was enough nice to send me images of all of them and here we are sharing them with you. According to David the seller claimed these as the work of Lantz himself and dates them at 1936. As said, I have a different opinion about the date...and I have absolutely no idea about the artist. I Swear That Comic Looks Nice But I wish There was some new info Out about the second woody woodpecker set (Pics Episodes anyting) do you have any new info about this set? if so, can you post it? I can't post anything but Jerry compiled the contents so this can only mean that it will be terrific. When did Lantz start using this version of Oswald? 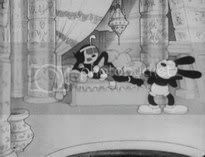 This version of Oswald first appeared on "Case of the Lost Sheep", released 9th December 1935. Nice clean artwork, but the gags are lame. Then again, it fits the era. Not the best gags, but the drawing and inking is really great. Actually, now that I've re-read the strips, this Oswald design looks similar to "Happy Scouts", released 20th June 1938 (the next-to-last Oswald cartoon). Forget my last comment, it's wrong. Gotta get my glasses cleaned! dont know much about happy scouts oswald rabbit but i have come across a b/w silent film of this is it worth anything? Did you Miss Me?. "A Mutt in a Rutt"
LTGC vol.5 - Something New Has Been Added!